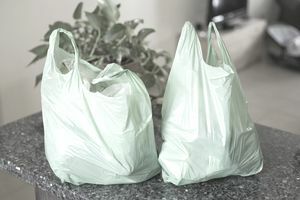 The compellingly convenient and ever-useful plastic shopping bag, perhaps even more versatile than duct tape, remains the centerpiece of the ongoing plastic bag controversy, It continues to be a divisive topic for policymakers, the public, commercial interests, and employees of the impacted businesses. To be clear, the plastic bag issue is nothing new. In fact, the first ban took place back in 1990 when the small Massachusetts island of Nantucket banned retail plastic bags, only 28 years after being invented in Sweden. You can click to see the Earth Policy Institute’s useful plastic bag timeline . The debate continues to burn. On one hand, opponents of plastic grocery bag bans argue that plastic bags are harmful to the environment. They don’t easily decompose in landfills, while many eventually end up on the beach or in the ocean, where they are implicated in such situations as the great Pacific garbage patch. One article suggests that 7 million tons of trash enter the oceans every year. In the same article, 41 percent of oceanic trash is observed to be plastic. On the other hand, the supporters of plastic shopping bag use say that banning plastic bags is environmentally and financially nearsighted, with alternatives being more devastating. Air Pollution. the report authors argue that plastic bags do not contribute to greater air pollution. Referencing a study released in 2011 by the Environmental Agency of England, In Evidence: Life Cycle Assessment of Supermarket Carrier Bags, they state that a reusable cotton shopping bag must be used at least 173 times before it becomes as environmentally friendly as an expendable plastic bag. (I have a fleet of reusable bags that are in no danger of reaching that total anytime soon). Water Pollution Here the report’s argument is far from convincing. They cite an academic who states that reports of water pollution have been over-reported yet none the less are troubling. Additionally, they argue that only 7.5 percent of solid waste is post-consumer plastic film. By logic should we have bans on organic waste because it composes a larger proportion of the solid waste stream? The merit of this argument isn't transparent. Health Risks of Reusable Bags The report points out one of the key arguments against reusable bags, the dangers of cross-contamination from unwashed reusable bags onto new purchases, presenting a substantial health risk to the public. Economic Impacts The Fraser Institute report presents information indicating that in some jurisdictions where anti-plastic bag ordinances have been put in place, there have been dips in sales, presumably due to reduced convenience, with resulting negative impacts on employment. (I’m not sure if this is a good argument to eliminate bans, or rather to make them universal). The fact that anti-plastic bag ordinances now are in place in over 130 cities and counties speaks to the strength of the case against shopping bags. According to the National Conference of State Legislatures, between 2015 and 2016 at least 77 bills were proposed by 23 states regarding the regulation of plastic bags in retail settings. Just three states—Arizona, Idaho, and Missouri enacted legislation in 2017, all of "which preempt local governments from regulating the sale or use of plastic bags, including the imposition of any fees or taxes." The cost of keeping plastic bag litter out of waterways and the ocean. According to the Natural Resources Defense Council, Californians pay $11 per capita each year to keep plastic bags from ending up in oceans as marine pollution. The cost to protect California waters from waste is around $428 million annually, with about 8 to 25 percent of this expenditure attributable to plastic bags. The cost of plastic bags jams resulting in damage to recycling equipment. In San Jose, California alone, damage caused by plastic film results in a $1 million loss annually. Impact on ocean life. Some 267 species have been adversely affected by plastic marine debris. Plastic bags eventually break down into small fragments. A recent story at treehugger.com outlines the ongoing struggle between proponents of bag bans and industry lobbyists in both Seattle as well as in California. In Seattle, city council ultimately succeeded in its ban. The author speculates that a new bill for a statewide ban of plastic bags in California will go up for a vote in 2014, with the support of the California Grocers Association. Meanwhile, industry works to boost recycling rates through initiatives such as those undertaken by Wegmans and other retailers. In Europe, European Union policy is increasingly looking to eradicate disposable plastic from the waste stream. The EU is looking for 55% of all plastic to be recycled by 2030 and for EU member states to cut back the consumption of bags per person from 90 a year to 40 by 2026.